Note that what I hope will turn into a series of posts should not be viewed as tutorial notes – they’re far more likely to be akin to student notes on a problem set the student is trying to work through, without having attended any of the required courses, and without having taken the time to read through a proper tutorial on the subject. Nor do I intend to to set out with a view to learning particular statistical techniques. Instead, I’ll be dipping into the world of stats looking for useful tools to see if they help me explore particular questions that come to mind and then try to apply them cut-and-past fashion, which is how I approach most of my coding! Bare naked learning, in other words. 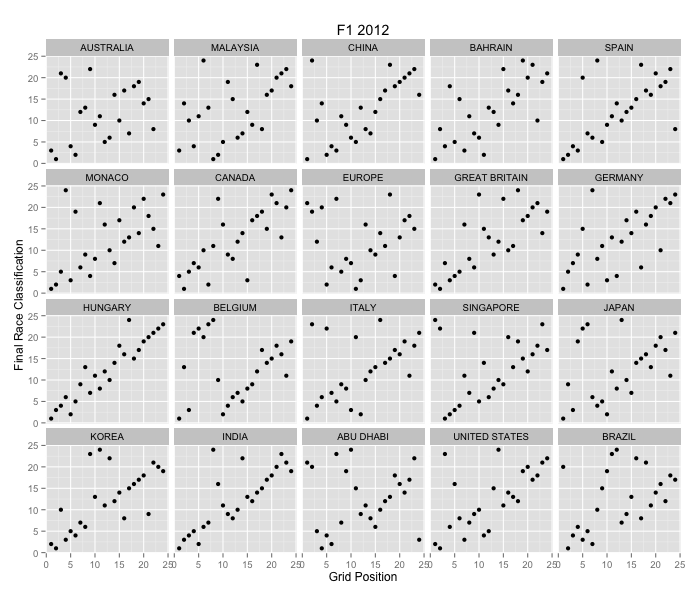 That’s the setting then… Now: #f1stats. What’s that all about? First up, I’ve been reading Nate Silver’s The Signal and the Noise, which mentions the aging stats and aging models for baseball players. 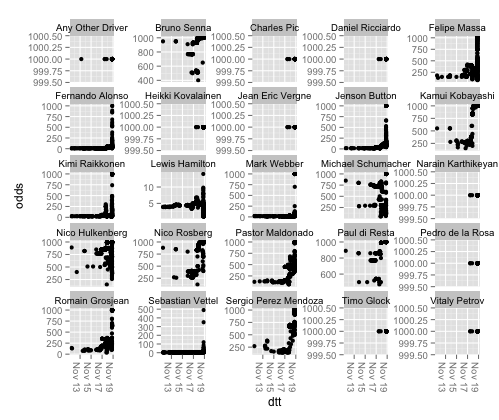 I found a paper on The Age Productivity Gradient: Evidence from a sample of F1 Drivers, which hasn’t got too many scary equations in, so I may try to replicate that and then bring the models up to date (the paper is dated 2009). It would have been so nice if the authors had published code equivalents in R that I could have played with directly, but I haven’t been able to find it if they did. I also found a paper on Estimated Age Effects in Baseball, again with equations but no code, but it may provide additional clues. From a quick skim, I think there may be some mileage in trying to get my head round different ways of comparing rankings. The article The wisdom of ignorant crowds: predicting sport outcomes by mere recognition explores a simple tournament winner predicting strategy based on how recognisable the names of competitors are. (I guess social media metrics might be a proxy for recognition? Hmm.. could test that I suppose with reference to this paper?) One thing that caught my eye were a couple of simple schemes for benchmarking different prediction models, which might be something I could pull on if I end up exploring prediction models? A paper on Outcome Uncertainty in NASCAR looks at how attendance and TV audience figures are influenced by race expectations, which might be something that could also be explored in context of UK F1 TV audience figures. That said, the notion of “outcome uncertainty” itself, and related measures, might also be worth exploring in their own right? If you know of any other relevant looking papers or articles, please post a link in the comments. PS FWIW, I also note the arrival of the Sports Analytics Innovation Summit in London in March… I doubt I have the impact required to make it as a media partner though… Although maybe OpenLearn does…?! Another preparatory step before I start learning about stats in the context of Formula One… There are a couple of things I’m hoping to achieve when I actually start the journey: 1) finding ways of using stats to help to pull out patterns and events that are interesting from a storytelling or news perspective; 2) seeing if I can come up with any models that help forecast or predict race winners or performances over a race weekend. There are a couple of problems I can foresee (?!) when it comes to the predictions: firstly, unlike horseracing, there aren’t that many F1 races each year to test the predictions against. Secondly, how do I even get a baseline start on the probabilities that driver X or team Y might end up on the podium? Odds are related to the anticipated likelihood of a particular event occurring and represent the winnings you get back (plus your stake) if a particular event happens. So 2/1 (2 to 1) fractional odds say: if the event happens, you’ll get 2 back for every 1 you placed, plus your stake back. If I bet 1 unit at 2/1 and win, I get 3 back: my original 1 plus 2 more. If I bet 3, I get 9 back: my original 3 plus 2 for every 1 I placed. Since I placed 3 1s, I get back 3 x 2 = 6 in winnings. Plus my original 3, which gives me 9 back on 3 staked, a profit of 6. Odds are related (loosely) to the likelihood of an event happening. 2/1 odds represent a likelihood (probability) that an event will happen (1/3) = 0.333… of the time (to cur down on confusion between fractional odds and fractional probabilities, I’ll try to remember to put the fractional probabilities in brackets; so 1/2 is fractional odds of 2 to 1 on, and (1/2) is a probability of one half). To see how this works, consider an evens bet, fractional odds of 1/1, such as someone might make for tossing a coin. The probability of getting heads on a single toss is (1/2); the probability of getting tails is also (1/2). If I’m giving an absolutely fair book based on these likelihoods, I’d offer you even odds that you get a head, for example, on a single toss. After all, it’s (fifty/fifty) (fifty per cent chance either way) of whether a heads or tails will land face up. If there are three equally possible outcomes, (1/3) each, then I’d offer 2/1. After all, it’s twice as likely that something other than the single outcome you called would come up. If there are four possible outcomes, I’d offer 3/1, because it’s likely (if we played repeatedly) that three times out of four, you’d be wrong. So every three times out of four you’d lose and I’d take your stake. And on the fourth go, when you get it right, I give you your stake back for that round plus three for winning, so over all we’d be back where we started. Decimal odds are a way of describing the return you get on a unit stake. So for a 2/1 bet, the decimal odds are three. For a 4/1 bet they’d be 5. For an N/1 bet they’d be 1+N. For an 1/2 (two to one on?) bet they’d be 1.5, for a 1/10 bet they’d be 1.1. So for a 1/M bet, 1+1/M. Generally, for an N/M bet, decimal odds are 1+N/M. In a completely fair book (?my phrase), the sum of the odds should lead to the summed probability of all possible events happening of 1. Bookmakers right the odds in their favour though, so the summed probabilities on a book will add up to more than 1 – this represents the bookmaker’s margin. If you’re betting on the toss of a coin with a bookie, they may offer you 99/100 for heads, evens for tails. If you play 400 games and bet 300 heads and 200 tails, winning 100 of each, you’ll overall stake 400, win 100 (plus 100 back) on tails along with 99 (plus 100 original stake) on heads. That is, you’ll have staked 400 and got back 399. The bookie will be 1 up overall. The summed probabilities add up to more than 1, since (1/2) + (1/(1+99/100)) = (0.5 + ~0.5025) > 1. One off bets are no basis for a strategy. You need to bet regularly. One way of winning is to follow a value betting strategy where you place bets on outcomes that you predict are more likely than the odds you’re offered. This is counter to how the bookie works. If a bookie offers you fractional odds of 3/1 (expectation that the event will happen (1/4) of the time), and you have evidence that suggests it will happen (1/3) of the time (decimal odds of 3, fractional odds 2/1) then it’s worth your while repeatedly accepting the bet. After all, if you play 12 rounds, you’ll wager 12, and win on 12/3=4 occasions, getting 4 back (3 + your stake) each time, to give you a net return of 4 x 4 – 12 = 16 – 12 = +4. If the event had happened at the bookie’s predicted likelihood of 1/4 of the time, you would have got back ( 12/4 ) * 4 – 12 = +0 overall. #There are probably better R protocols for doing this? There are apparently also “efficient” ways of working out what stake to place (the “staking strategy”). The value strategy gives you the edge to win, long term, the staking strategy is how you maximise profits. See for example Horse Racing Staking and Betting: Horse racing basics part 2 or more mathematical treatments, such as The Kelly Criterion or Statistical Methodology for Profitable Sports Gambling. See also the notion of “betting rules”, eg A statistical development of fixed odds betting rules in soccer. To recap then, what I think I’ve learned is that we can test predictions against the benchmark of offered odds. The offered odds in themselves give us a ballpark estimate of what the (expert) bookmakers, as influenced by the betting/prediction market, expect the outcome of an event to be. 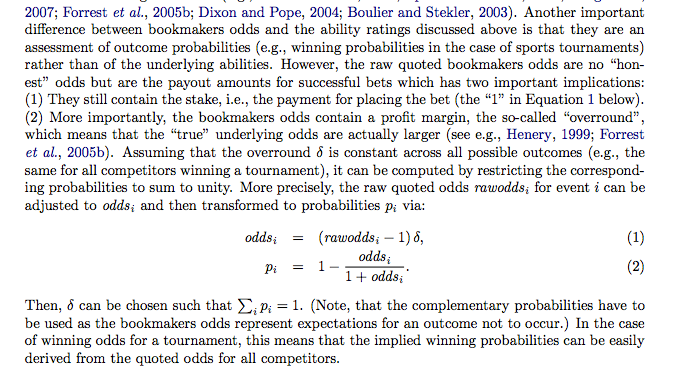 Note that the odds are rigged to give summed probabilities over a range of events happening to be greater than 1, to build in a profit margin (does it have a proper name?) for the bookmaker. If we have a prediction model that appears to offer better odds on an event than the odds that are actually offered, and we believe in our prediction, we can run a value betting strategy on that basis and hopefully come out, over the long term, with a profit. The size of the profit is in part an indicator of how much more accurate our model is as a predictive model than the expert knowledge and prediction market basis that is used to set the bookie’s odds. 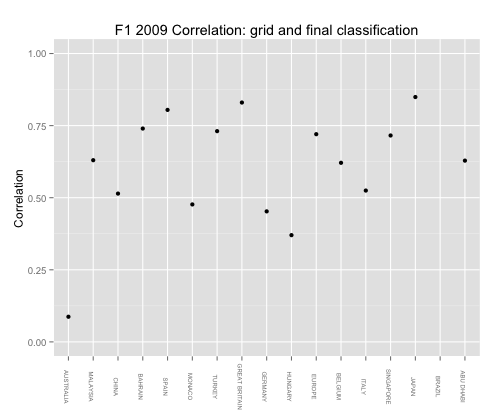 I finally, finally made time to get started on my statistics learning journey with a look at some of the results in the paper A Tale of Two Motorsports: A Graphical-Statistical Analysis of How Practice, Qualifying, and Past SuccessRelate to Finish Position in NASCAR and Formula One Racing. Note that these notes represent a description of the things I learned trying to draw on ideas contained within the paper and apply it to data I had available. There may be errors… if you spot any, please let me know via the comments. 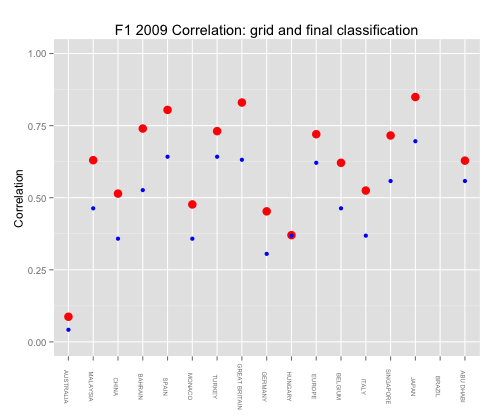 The paper uses race classification data from the 2009 season, comparing F1 and NASCAR championships and claiming to explore the extent to which positions in practice and qualifying relate to race classification. I won’t be looking at the NASCAR data, but I did try to replicate the F1 stats which I’ll start to describe later on in this post. I’ll also try to build up a series of interactive apps around the analyses, maybe along with some more traditional print format style reports. As a source of data, I used my f1com megascraper that grabs classification data (along with sector times and fastest laps) since 2006. (The ergast API doesn’t have the practice results, though it does have race and qualifying results going back a long way, so it could be used to do a partial analysis over many more seasons). I downloaded the whole Scraperwiki SQLite database which I could then load into R and play with offline at my leisure. 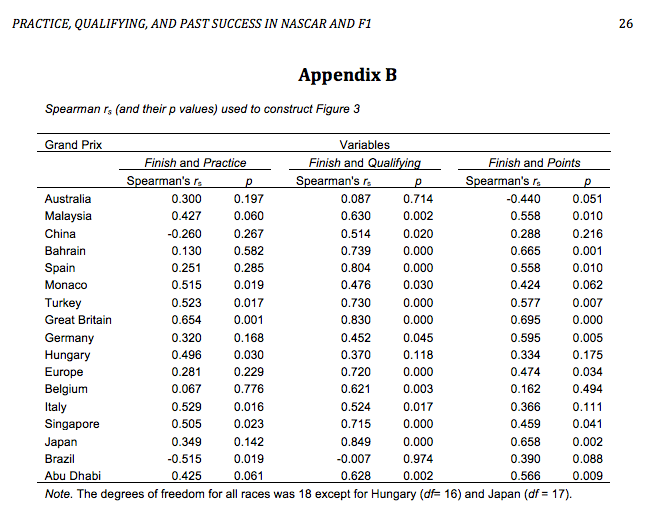 The first result of note in the paper is a chart that claims to demonstrate the Spearman rank correlation between practise and race results, qualification and race results, and championship points and race results, for each race in the season. The caption to the corresponding NASCAR graphs explains the shaded region: “In general, the values in the grey area are not statistically significant and the values in the white area are statistically significant.” A few practical uses we might put the chart to come to mind (possibly! ): is qualifying position or p3 position a good indicator of race classification (that is, is the order folk finish at the end of p3 a good indicator of the rank order in which they’ll finish the race?)? 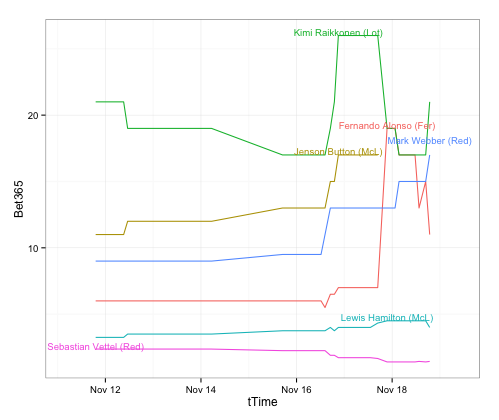 ; if the different rank orders are not correlated, (people finish the race in a different order to the gird position), does this say anything about how exciting the race might have been? Does the “statistical significance” of the correlation value add anything meaningful? So what is this chart trying to show and what, if anything, might it tell us of interest about the race weekend? Correlation, then, describes the extent to which two things tend to change over time in a similar way: when one goes up, the other goes up; when one goes down, the other goes down. (If they behave in opposite ways – if one goes up steeply the other goes down steeply; if one goes up gently, the other goes down gently – then they are negatively or anti-correlated). 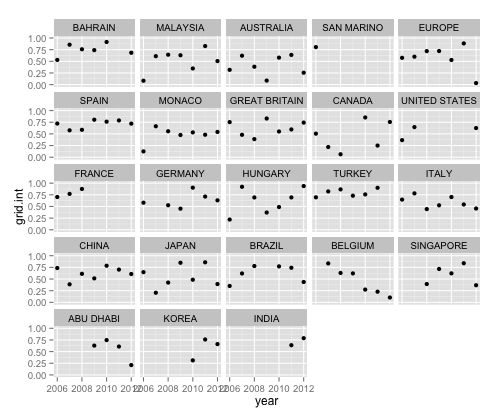 Correlation measures require that you have paired data. 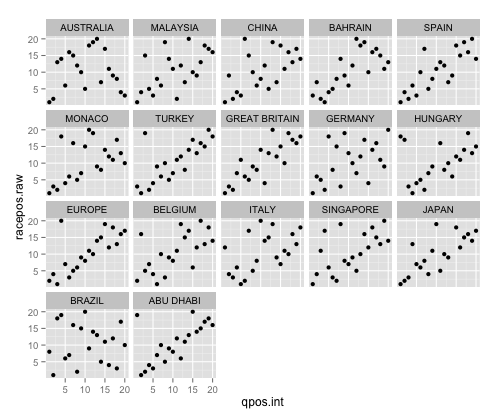 You know you have paired data if you can plot your data as a two dimensional scatterplot and label each point with the name of the person or thing that was measured to get the two co-ordinate values. So for example, on a plot of qualifying position versus race classification, I can label each point with the name of the driver. 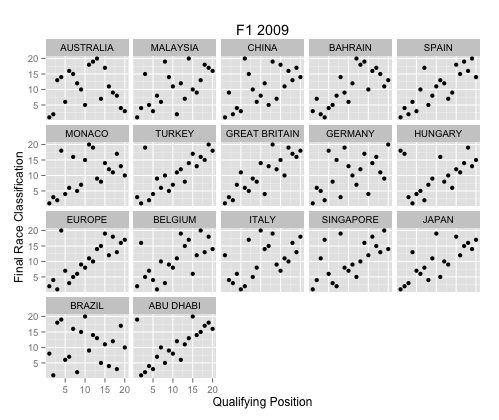 The qualification position and race classification is paired data around the set of drivers. A rank correlation coefficient is used to describe the extent to which two rankings are correlated. Ranked orders do away with the extent to which different elements in a series differ from each other and just concentrate on their rank order. That is, we don’t care how much change there is in each of the data series, we’re just interested in rank positions within each series. In the case of an F1 race, the distribution of laptimes during qualifying may see the first few cars separated by a few thousandths of a second, but the time between the best laptimes of consecutively placed cars at the back of the grid might be of the order of tenths of a second. (Distributions take into account, for example, the variety and range of values in a dataset.) However, in a rank ordered chart, all we are interested in is the integer position: first, second, third, …, nineteenth, twentieth. There is no information about the magnitude of the actual time difference between the laptimes, that is, how far close to or far apart from each other the laptimes of consecutively placed cars were, we just know the rank order of fastest to slowest cars. 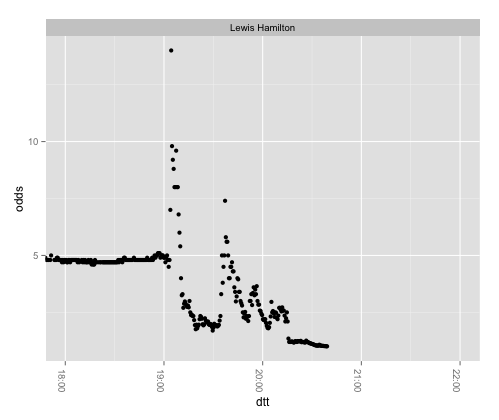 The distribution of the rank values is not really very interesting, or subject to change, at all. One thing that I learned that’s possibly handy to know when decoding the jargon: rank based stats are also often referred to as non-parametric statistics because no assumptions are made about how the numbers are distributed (presumably, there are no parameters of note relating to how the values are distributed, such as the mean and standard deviation of a “normal” distribution). If we think about the evolution of laptimes in a race, then most of them will be within a few tenths of the fastest lap each lap, with perhaps two bunches of slower lap times (in-lap and out-lap around a pitstop). The distribution of these lap times may be interesting (for example, the distribution of laptimes on a lap when everyone is racing will be different to the distribution of lap times on a lap when several cars are pitting). On the other hand, for each lap, the distribution of the rank order of laptimes during that lap will always be the same (first fastest, second fastest, third fastest, etc.). That is not to say, however, that the rank order of the drivers’ lap times does not change lap on lap, which of course it might do (Webber might be tenth fastest on lap 1, fastest on lap 2, eight fastest on lap three, and so on). The statistic chosen was Spearman’s rank correlation coefficient. Three differently calculated correlation coefficients appear to be widely used, (and also appear as possible methods in the R corr() function that calculates correlations between lists of numbers): i) Pearson’s product moment correlation coefficient (how well does a straight line through an x-y scatterplot of the data describe the relationship between the x and y values, and what’s the sign of its gradient); ii) Spearman’s rank correlation coefficient (also known as Spearman’s rho or rs); [this interactive is rather nice and shows how Pearson and Spearman correlations can differ]; iii) Kendall’s τ (that is, Kendall’s Tau; this coefficient is based on concordance, which describes how the sign of the difference in rank between pairs of numbers in one data series is the same as the sign of the difference in rank between a corresponding pair in the other data series.). Other flavours of correlation coefficient are also available (for example, Lin’s concordance correlation coefficient, as demonstrated in this example of identifying a signature collapse in a political party’s electoral vote when the Pearson coefficient suggested it had held up, which I think is used to test for how close to a 45 degree line the x-y association between paired data points is…). The statistical significance test is based around the “null hypothesis” that the two sets of results are not correlated; the result is significant if they are more correlated than you might expect if both are randomly ordered. this made me a little twitchy: wouldn’t it be equally valid to argue that F1 is a procession and we would expect the race position and grid position to be perfectly correlated, for example, and then define our test for significance on the extent to which they are not? This comparison of Pearson’s product moment and Spearman’s rank correlation coefficients helped me get a slightly clearer view of the notion of “test” and how both these coefficients act as tests for particular sorts of relationship. The Pearson product moment coefficent has a high value if a strong linear relationship holds across the data pairs. The Spearman rank correlation is weaker, in that it is simply looking to see whether or not the relationship is monotonic (that is, things all go up together, or they all go down together, but the extent to which they do so need not define a linear relationship, which is an assumption of the Pearson test.). In addition, when defining the statistical significance of the test, this is dependent on particular assumptions about the distribution of the data values, at least in the case of the Pearson test. The statistical significance relates to how likely the correlation value was assuming a normal distribution in the values within the paired data series (that is, each series is assumed to represent a normally distributed set of values). If I understand this right, it means we separate the two things out: on the one hand, we have the statistic (the correlation coefficient); on the other, we have the significance test, which tells you how likely that result us given a set of assumptions about how the data is distributed. A question that then comes to mind is this: is the definition of the statistic dependent on a particular distribution of the data in order for the statistic to have something interesting to say, or is it just the significance that relies on that distribution. To twist this slightly, if we can’t do a significance test, is the statistic then essentially meaningless (because we don’t know whether those values are likely to occur whatever the relationships (or even no relationship) between the data sets?). Hmm.. maybe a statistic is actually a measurement in the context of its significance given some sort of assumption about how likely it is to occur by chance? As far as Spearman’s rank correlation coefficient goes, I was little bit confused by the greyed “not significant” boundary on the diagram shown above. 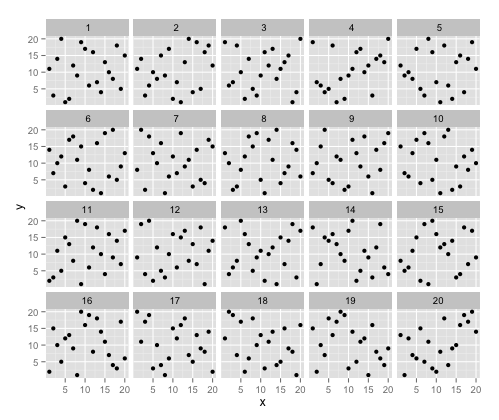 The claim is that any correlation value in that grey area could be accounted for in many cases by random sorting. 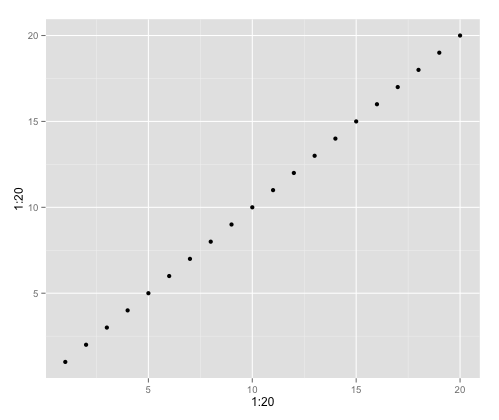 Take two sets of driver numbers, sort them both randomly, and much of the time the correlation value will fall in that region. (I suspect this is not only arbitrary but misleading? If you have random orderings, is the likelihood that the correlation is in the range -0.1 to 0.1 the same as the likelihood that it will be in the range 0.2 to 0.4? Is the probability distribution of correlations “uniform” across the +/- 1 range?) Also, my hazy vague memory is that the population size affects the confidence interval (see also Explorations in statistics: confidence intervals) – isn’t this the principle on which funnel plots are built? The caption to the figure suggests that the population size (the “degrees of freedom”) was different for different races (different numbers of drivers). So why isn’t the shaded interval differently sized for those races? Something else confused me about the interval values used to denote the significance of the Spearman rho values – where do they come from? A little digging suggested that they come from a table (i.e. someone worked them out numerically, presumably by generating looking at the distribution of different random rank orderings, rather than algorithmically – I couldn’t find a formula to calculate them? I did find this on Sample Size Requirements for Estimating Pearson, Kendall and Spearman Correlations by D Bonett (Psychometrika Vol. 65, No. 1, 23-28, March 2000) though). A little more digging suggested Significance Testing of the Spearman Rank Correlation Coefficient by J Zar (Journal of the American Statistical Association, Vol. 67, No. 339 (Sep., 1972), pp. 578- 580) as a key work on this, with some later qualification in Testing the Significance of Kendall’s τ and Spearman’s rs by M. Nijsse (Psychological Bulletin, 1988, Vol. 103, No. 2,235-237). 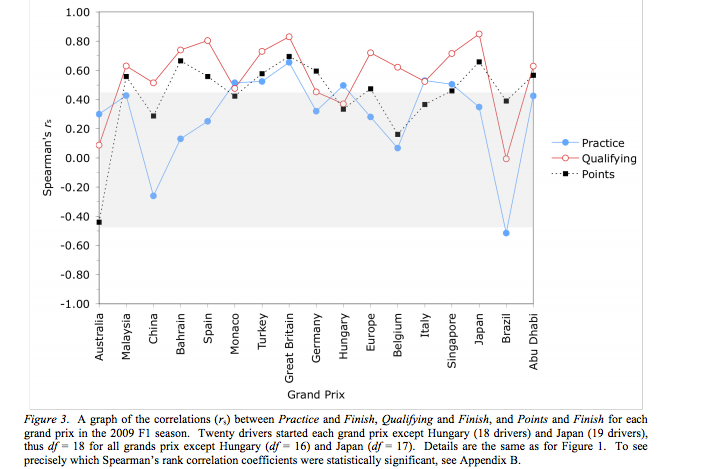 As part of my “learn about Formula One Stats” journey, one of the things I wanted to explore was how F1 betting odds change over the course of a race weekend, along with how well they predict race weekend outcomes. Courtesy of @flutterF1, I managed to get a peek of some betting data from one of the race weekends last year year. In this preliminary post, I’ll describe some of the ways I started to explore the data initially, before going on to look at some of the things it might be able to tell us in more detail in a future post. The data @flutterF1 showed me came in two spreadsheets. The first (filename convention RACE Betfair Odds Race Winner.xlsx) appears to contain a list of frequently sampled timestamped odds from Betfair, presumably, for each driver recorded over the course of the weekend. The second (filename convention RACE Bookie Odds.xlsx) has multiple sheets that contain less frequently collected odds from different online bookmakers for each driver on a variety of bets – race winner, pole position, top 6 finisher, podium, fastest lap, first lap leader, winner of each practice session, and so on. Both the spreadsheets were supplied as Excel spreadsheets. I guess that many folk who collect betting data store it as spreadsheets, so this recipe for loading spreadsheets in to an R environment might be useful to them. The gdata library provides hooks for working with Excel documents, so I opted for that. The US Betfair Odds Race Winner.xslx is a raw data collection with 5 columns…. 1) The timestap (an annoying format but there is a reason for this albeit a pain to work with). 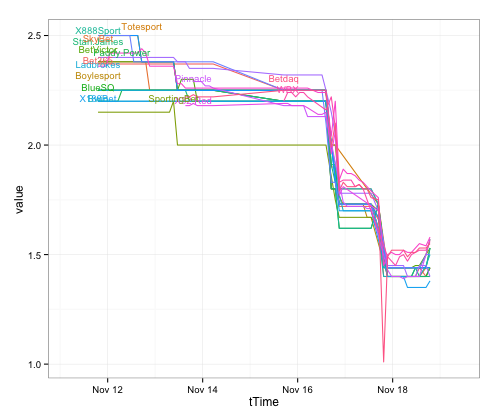 3) The last price money was traded at. 4) the total amount of money traded on that driver so far. 5) If the race is in ‘In-Play’. True means the race has started – however this goes from the warm up lap, not the actual start. To reduce the amount of data I only record it when the price traded changes or if the amount changes. #This is a hacked way of doing it. How do I do it properly? Here are the charts (obviously lacking in caption, tidy labels and so on). That all seems to work okay, so how about the other spreadsheet? #Note that I am not I checking for gotcha rows, though maybe I should...? # "Time" "Runner" "Bet365" "SkyBet" "Totesport" "Boylesport" "Betfred"
#  "SportingBet" "BetVictor" "BlueSQ" "Paddy.Power" "Stan.James" "X888Sport" "Bwin"
# "Ladbrokes" "X188Bet" "Coral" "William.Hill" "You.Win" "Pinnacle" "X32.Red"
# "Betfair" "WBX" "Betdaq" "Median" "Median.." "Min" "Max"
Following the roundabout tour of F1Stats – A Prequel to Getting Started With Rank Correlations, here’s a walk through of my attempt to replicate the first part of A Tale of Two Motorsports: A Graphical-Statistical Analysis of How Practice, Qualifying, and Past SuccessRelate to Finish Position in NASCAR and Formula One Racing. Specifically, a look at the correlation between various rankings achieved over a race weekend and the final race position for that weekend. The intention behind doing the replication is two-fold: firstly, published papers presumably do “proper stats”, so by pinching the methodology, I can hopefully pick up some tricks about how you’re supposed to do this stats lark by apprenticing myself, via the web, to someone who has done something similar; secondly, it provides an answer scheme, of a sort: I can check my answers with the answers in the back of the book published paper. I’m also hoping that by working through the exercise, I can start to frame my own questions and start testing my own assumptions. …because this is an R-based replication… (I use RStudio for my R tinkerings; if you need to change directory when you’re in R, setwd('~/path/to/myfiles')). The last two commands each display a list of the names of the database tables that can be loaded in as separate R dataframes. #Note: I haven't used SQL that much so there may be a more efficient way of writing this? #  "1"   "10"  "11"  "12"  "13"  "14"  "15"  "16"  "17"  "18"  "19"  "2"   "3"   "4"   "5"   "6"   "7"   "8"   "9"
#  "AUSTRALIA"     "MALAYSIA"      "CHINA"         "BAHRAIN"       "SPAIN"         "MONACO"        "TURKEY"
#  "GREAT BRITAIN" "GERMANY"       "HUNGARY"       "EUROPE"        "BELGIUM"       "ITALY"         "SINGAPORE"
# "JAPAN"         "BRAZIL"        "ABU DHABI"
Now focus on a single chart and thing about that the positioning of the points actually means. If the qualifying position was the same as the race position, what would you expect to see? That is, if the car that qualified first finished first; the car that qualified second finished second; the car that qualified tenth finished tenth; and so on. As the axes are incrementally ordered, I’d expect to see a straight line, going up at 45 degrees if the same space was given on each axis (that is, if the charts were square plots). Looking over the race charts, some of the charts have the points plotted roughly along a straight line – Turkey and Abu Dhabi, for example. If the cars started the race roughly according to qualifying position, this would suggest the races may have been rather processional? On the other hand, Brazil is all over the place – qualifying position appears to bear very little relationship to where the cars actually finished the race. There’s not a lot of order in there, is there? However, it is worth noting that on occasion it may look as if there is some sort of ordering (as in trial 4, for example? ), purely by chance. We can also grab a plot for a single race. The paper showed scatterplots for Brazil and Japan. 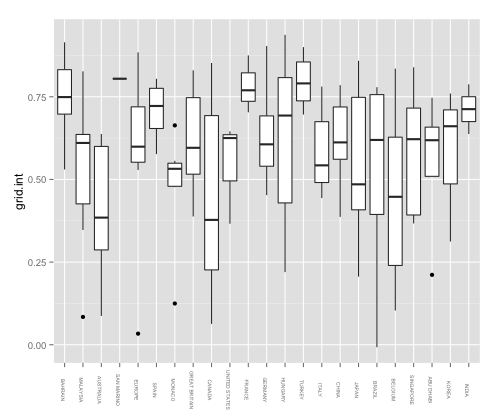 Note that I have: i) filtered the data to get just the data required for each race; ii) added a little bit more styling with the theme_bw() call; iii) used the gridExtra package to generate the side-by-side plot. Generating similar views for other years should be trivial – simply tweak the year selector in the SELECT query and then repeat as above. Okay – enough for now… am I ever going to get even as far as blogging the correlation analysis., let alone the regressions?! Hopefully in the next post in this series! Was it as you remember it?!! Were Australia and Malaysia all over the place? Was there a big crash amongst the front runners in Belgium? !